Do you want to know about pooja room designs? Well, then check these pooja room designs to know more. 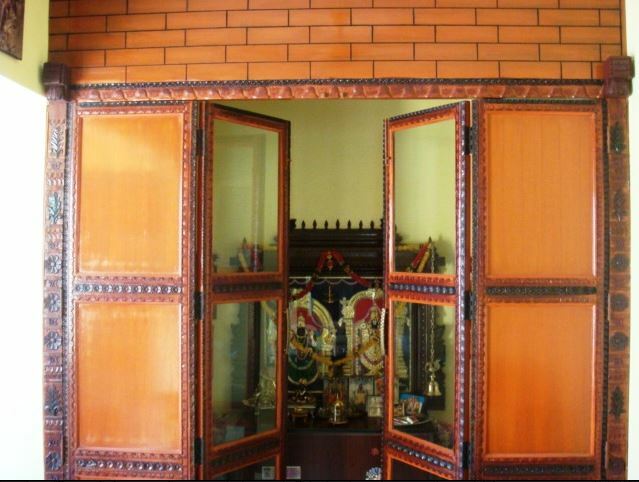 Pooja room is the most sacred place in a Hindu household. Hindu’s are very religious and they offer prayer to their deities everyday. Therefore, they need a separate room where they can sit and meditate. Not everyone is lucky enough to have a separate pooja room, so most people make use of shelves, stand alone mandap, or a cabinet for the same. According to Vastu, pooja room should be set up in the north, east or north-east corner of the house to bring health, wealth, and happiness. Pooja room should never be located inside the bedroom, under the staircase or next to a bathroom or a kitchen, as it’s believed to bring bad luck. Pooja room designs differ from house to house. Some like to keep it simple while others like to keep it grand. 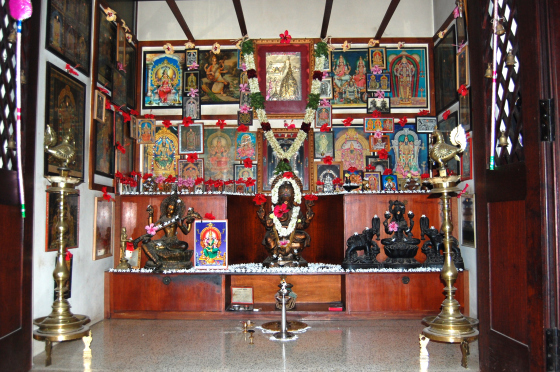 Pooja room is decorated beautifully and idol of deities are placed in there. These idols are usually made of bronze or beautifully carved clay to give it a divine look. Copper, marble, silver and gold idols are also available in the market. Some of us keep photos of our deities in the pooja room instead of idols. But, at the end material is irrelevant, the only thing that matters is the purity of your heart and soul. There are a lot of things to keep in mind when making pooja room designs. Here are some tips and ideas. Choose neutral or earthen colors for your pooja room to give it a soothing feel. Bright colors create a lot of distraction and can disrupt the flow of positive energy. Light colors create a spiritual ambience full of tranquility. White, beige, cream, and browns are perfect for creating good pooja room designs. They open up the room and help set up the right ambience and feel for prayer. After coloring the room, it’s time to decide on the theme. You can create a glass theme by using glass shelves and accessories. If that does not appeal to you, create a traditional look by use of wood or a metallic look by using metals. 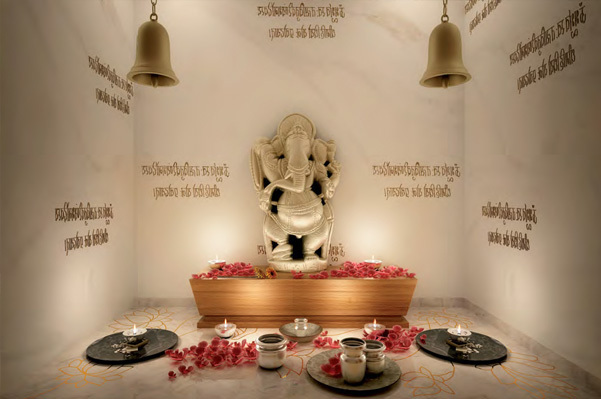 You can also make pooja room designs and theme in marble and silver. You can even choose a color or colors as the theme of your pooja room. Decorate your pooja room according to the theme. Choice of idol depends on the theme of your pooja room. 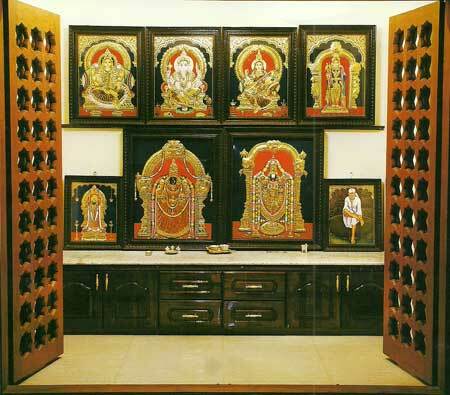 The size of your pooja room also plays a vital role when buying idols. If you place too many large idols in a small room, it will look cramped and cluttered. Vice-versa if you place small idols in a large pooja room, it might not look interesting enough. Therefore, buy idols according to the theme, size and decor of your pooja room. Give your pooja room a new look by placing a mandap in it. 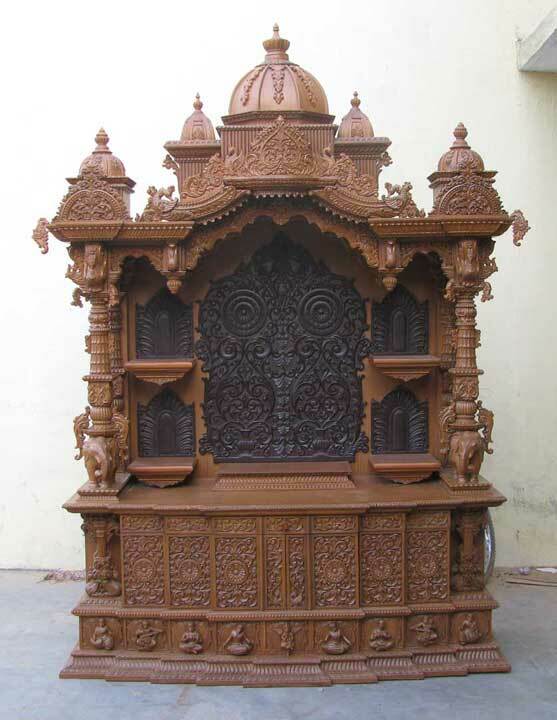 Mandap is a platform with pillar like structures balancing its top. A large variety of mandaps are in all kinds of designs, shape and sizes are available in the market. They are usually made of wood, or metals like brass, bronze, silver and gold with intricate carvings on them. 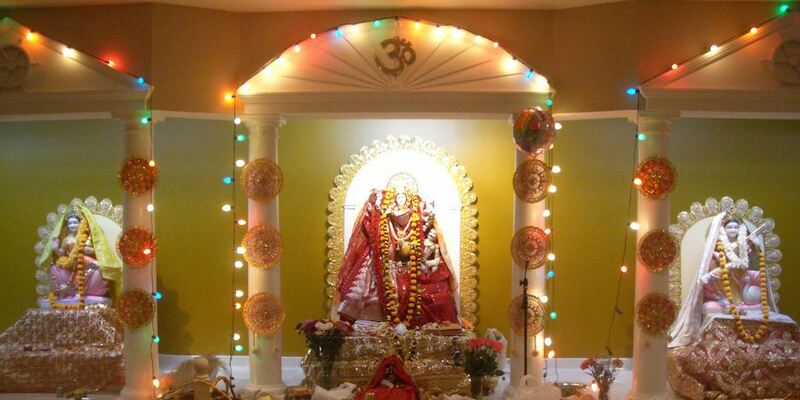 While buying a mandap keep in mind the theme of your pooja room and idol size. Pooja room designs also include accessories. Foremost accessory of pooja room are incense holders, oil lamps, bells and other utensils used during prayer. Use them to add aesthetic appeal to your pooja room. You can easily find oil lamps in sizes varying from a few inches to a few feet tall. They are available in beautiful shape, design and material. Add beauty to pooja room designs by use of bells. You can either hang them on the ceiling or use small ones on the door as decoration. You can use a lot of creative ideas to decorate the walls of your pooja room. You can hang a beautiful painting of your deity. Add colorful paper art, flower hangings on to the wall. Religious symbols or mantras can also be inscripted on to it. Lights can also be used to enhance the beauty of your pooja room designs. Go for chandeliers, wall sconces or colorful string lights to brighten up the room and its walls. 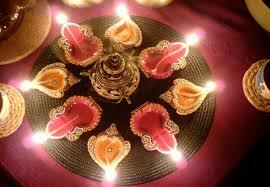 Diyas add to the divine look of your pooja room designs. These earthen pots are hand-made by artisans and are available everywhere in India. They are beautiful and available in many colorful designs and patterns. Using diya is one of the most inexpensive ways to decorate the pooja room. Give a personal touch to your pooja room by using your hand painted diyas. It’s quite easy, use acrylic, water or oil paint to color them. Once done dry them in the sun. Involve your kids in diya painting and have a nice time together. Flowers are offered to the deity during pooja ceremonies, you can use it to adorn the pooja room too. Make strings of fresh flowers and hang it on the mandap or the entrance of your pooja room. Else, decorate the floor by making gorgeous patterns and designs using flower petals. Decorate pooja room shelves and aarti ki thali using flowers. 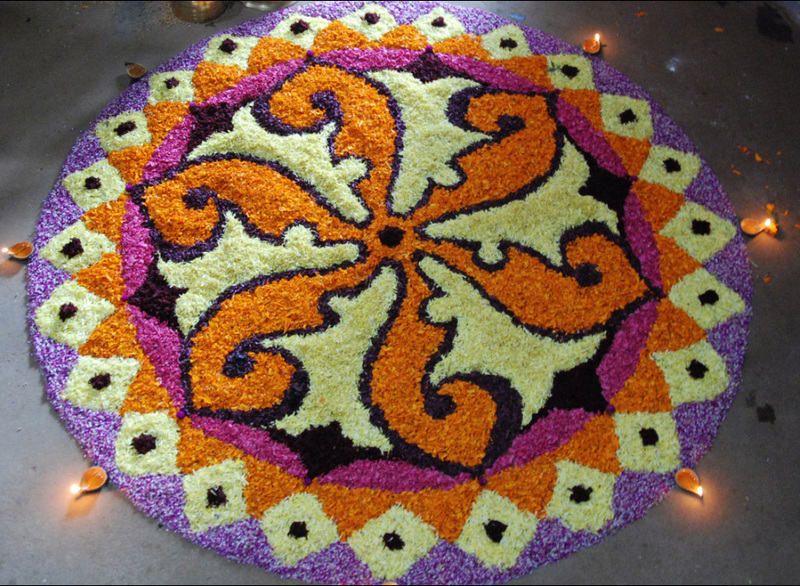 Colorful rangoli or kolam is another way to add beauty to your pooja room designs. It’s a traditional art form practiced in India from ancient times to welcome guests. They are made using colorful saw dust, rice powder, colored sand, chalk, chalk powder, and flower petals. If you are not an artist, buy ready-made rangoli templates available in market. Dress up your god and goddesses in bright glittering attire. Use lots of colors like red, yellow, orange, saffron etc. Adorn them with jewelry and crown; they easily are available in the market. But, if you can make them yourself it would be just great. 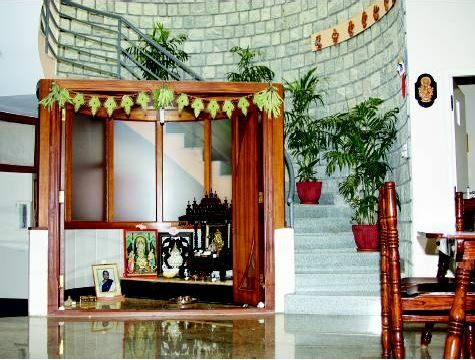 Hope now you have got enough tips, ideas and inspiration on how to build a pooja room. 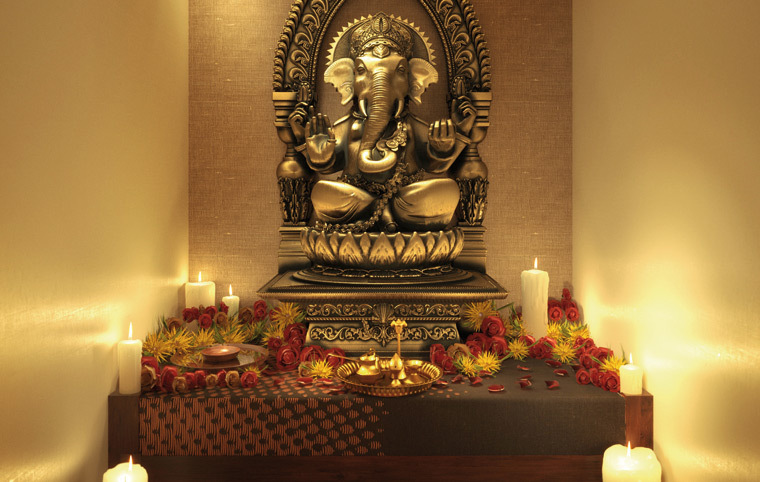 Create some amazing pooja room designs and see your deity glitter and glow in divinity. 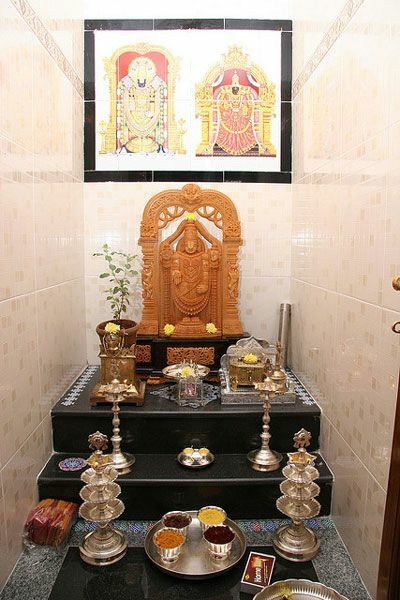 This entry was posted in Pooja Room, Pooja Room Designs and tagged Decoration for Diwali, Decoration Ideas for Diwali, Design of Pooja Room within a House, Diwali, Diwali Decoration Ideas, Durga Puja Decoration Ideas, Home decoration for Festivals, Home Improvement Ideas, Home Makeover in India, Pooja Room, Pooja Room Decoration Ideas, Pooja Room Design, Pooja Room Designs, Pooja Room Ideas, Pooja Room Interior Decoration, Pooja Room Interior Design, Pooja Roonm Interior Decoration Tips by Homemakeover. Bookmark the permalink.